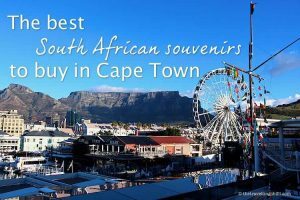 What are great travel souvenirs? I must admit, I love every item I have ever brought back from my trips. However, most of them are just to look at. So over the last few years I decided to mainly look for memorable and more importantly, useful souvenirs. Those can be a scarf that can be worn every winter, earrings for special occasions or a beautiful teapot, that can actually be used (not the terracotta one I brought from Peru that looks beautiful but is not great for sipping a tea). Very important to take into account as well is the size and weight. I have carried heavy and large items, not enjoying the rest of my trip since I was too busy dragging the items around and being scared for them to break. One of the places I really love for buying souvenirs is Qatar. 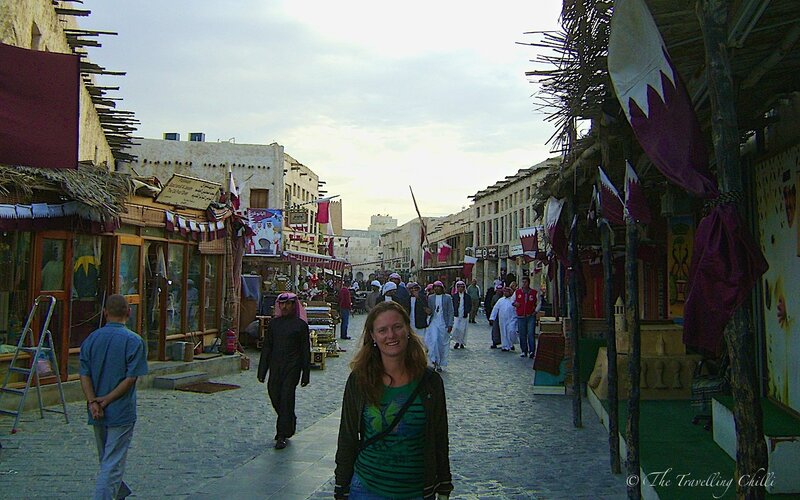 Doha has lot’s of interesting places to go shopping, but nothing beats the local market for finding traditional souvenirs. 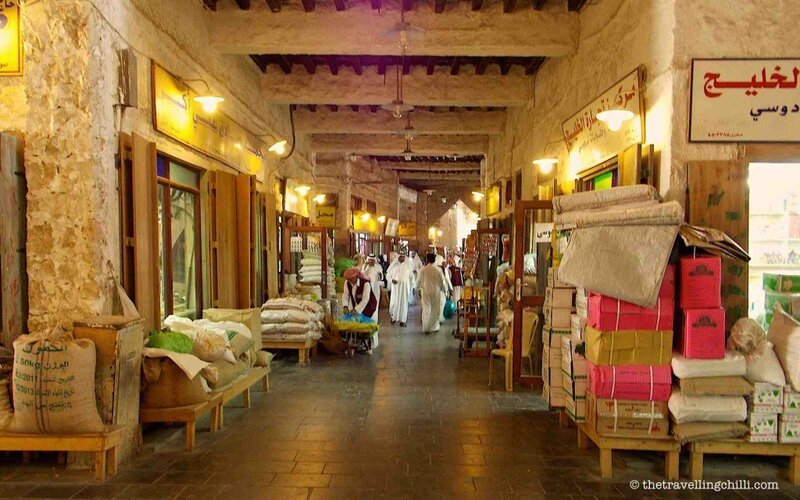 The largest and most interesting market is Souq Waqif. 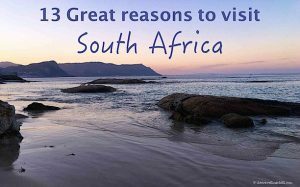 It’s a very popular place with tourists as well as local Qatari. 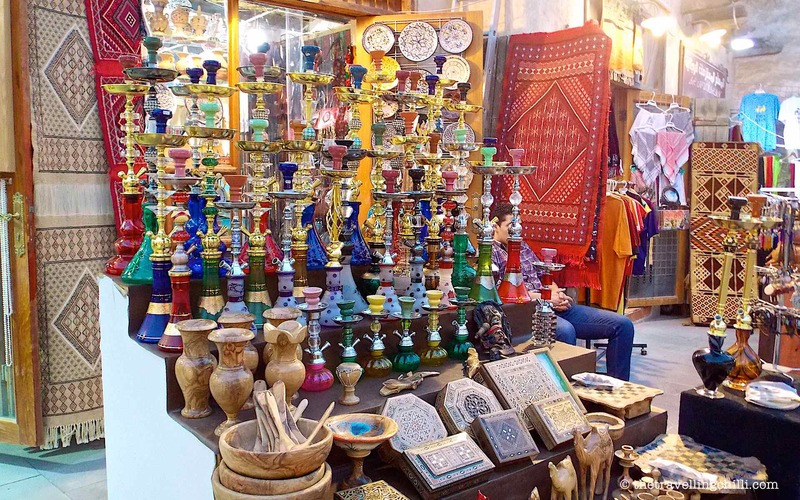 The Souq has a very authentic feel, with a nice selection of restaurants and coffee shops as well as different market places each offering local items. 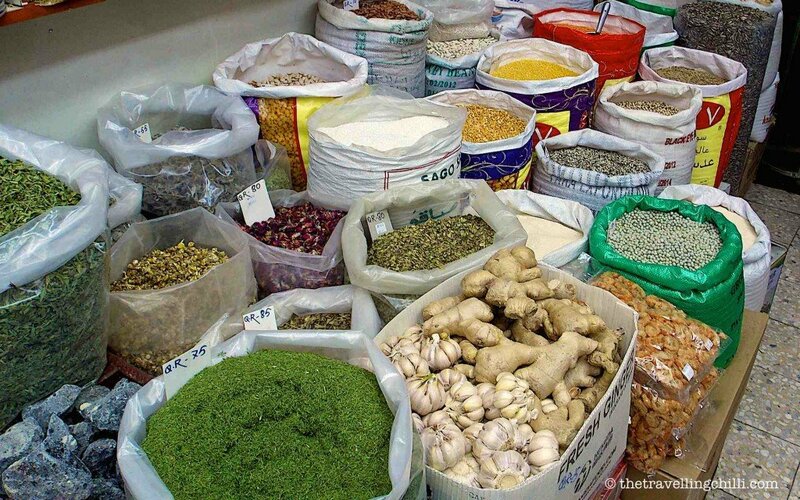 Most Souqs are organised according to what they sell, so it’s easy to navigate around the different stalls. 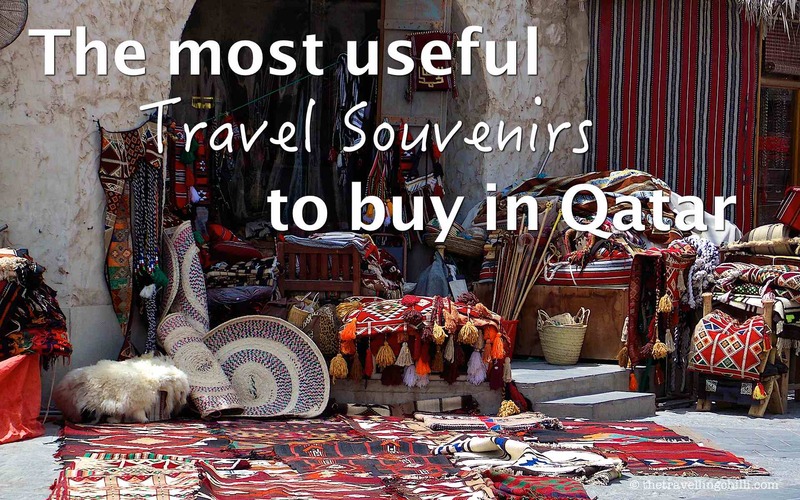 What to buy in Souq Waqif? 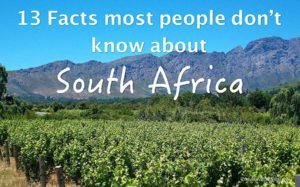 You can basically find most items there, like gold, pearls, spices, dried fruit like dates, textiles, kitchenware and beautiful wooden items. What to buy in Doha? 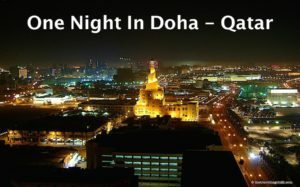 I have visited Qatar twice, although the second time was not really planned. We had missed our connecting flight, by no fault of our own, at Doha Airport, which was solved perfectly by Qatar Airways. So we had 24 hours we could spend in Doha, just before Christmas. Perfect timing to buy the last Christmas presents for family and to top up my list of souvenirs since my previous visit for myself. Qatar is the pearl capital of the world. 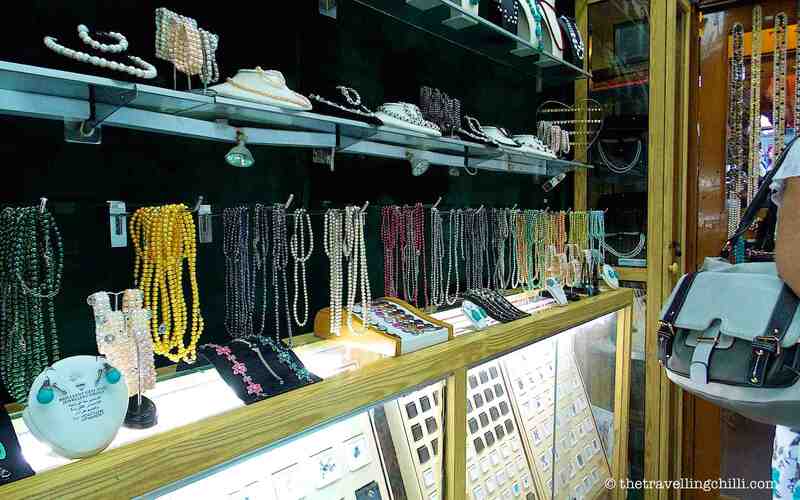 There are so many shops with beautiful jewellery made from pearls. I am not really big on jewels, but I love the pearl earrings and necklaces I brought from Doha. 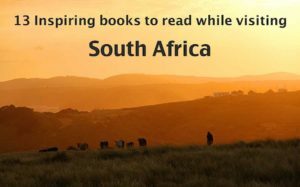 They are not expensive and are really a great gift to anyone, especially around Christmas. Apart from pearls, there is lot’s of jewellery made from gold, amber and other (semi-)precious stones. What I like about this is that it’s a small item which is easy to carry around, so you can take more and above all, most woman love pearls and jewels. You hardly ever go wrong with this when buying a gift for someone (or for yourself). Something that I cannot resist when travelling is walking into a spice area. 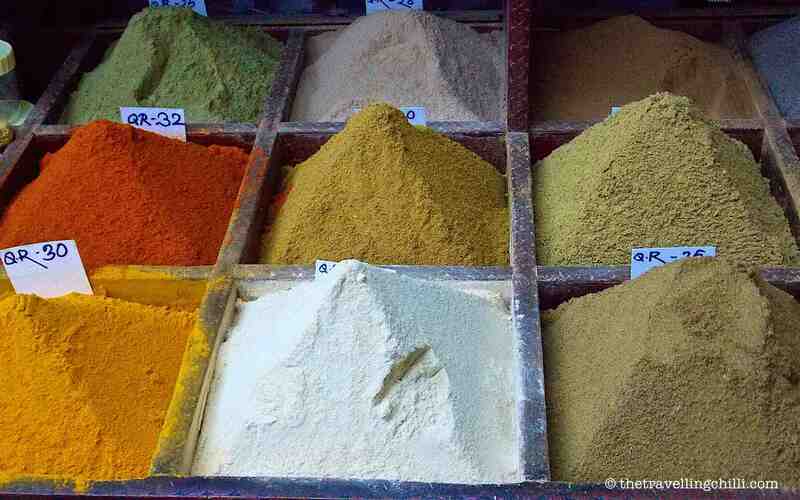 If it’s a country without a spice market, I will find the spice rack of any local supermarket. I love the beautiful smell and aroma of saffron, cardamon, cinnamon and chillies. I love looking at the diversity of colourful pyramids of tumeric, cumin and various curry mixes. 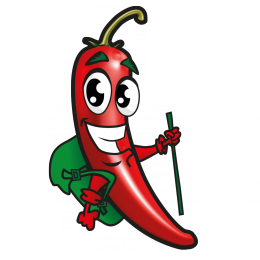 It’s difficult to resist bringing home local cuisine in the form of spices and to try to make the same dishes at home that you ate locally (which never work out the same). It’s easy to pack away, just make sure it’s properly wrapped and the colourful powder does not end up on your favourite clothes. 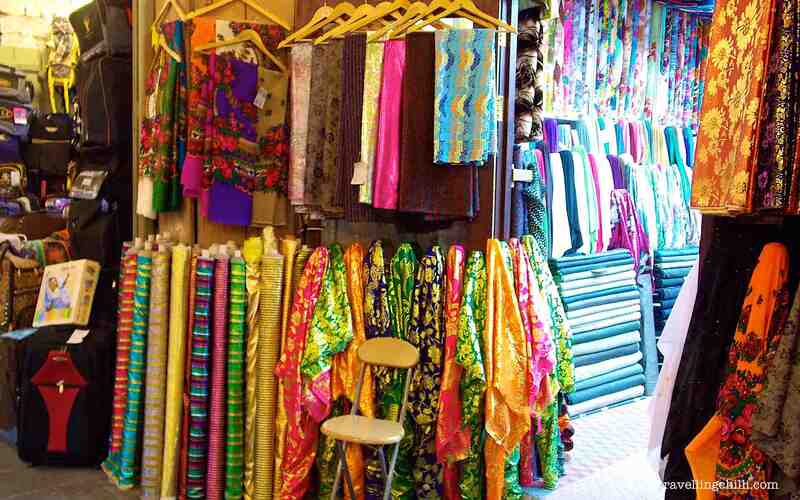 The availability of textiles and fabrics in Doha is huge. The Souq offers a large selection of colours, styles and materials at very affordable prices. If you know how to sew yourself, or know someone who can, this is perfect to bring home. It’s timeless and can be worn anytime and almost anywhere. They are useful, they are handy, they are beautiful and they come in different colours. I have quite a few and I use them on a lot on various occasions. 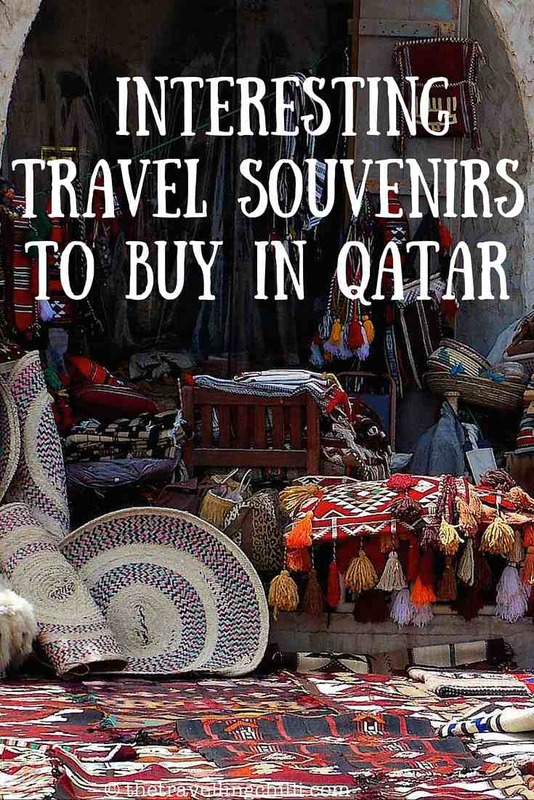 They are very inexpensive in Qatar compared to other destinations so definitely consider taking a look at them. I always travel with a least 1 pashmina, even when I go camping. You never know you’ll have to go to a smarter occasion and a pashmina works like a charm. Great traditional souvenirs are the beautifully decorative wooden boxes. They come in all shapes and sizes and are a perfect gift. 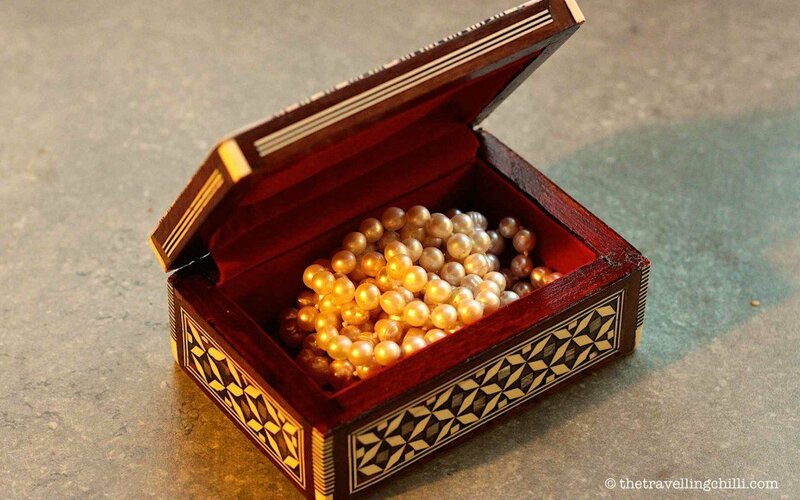 They look nice and at the same time are very useful to store smaller items like your recently obtained pearls. The Dallah or Arabic Coffee pot has been used for centuries to brew a traditional spicy, bitter coffee. They just look beautiful and can be used as a great decoration. It’s another decoration item, but they are just too beautiful. Also a perfect item for the real coffee lovers. 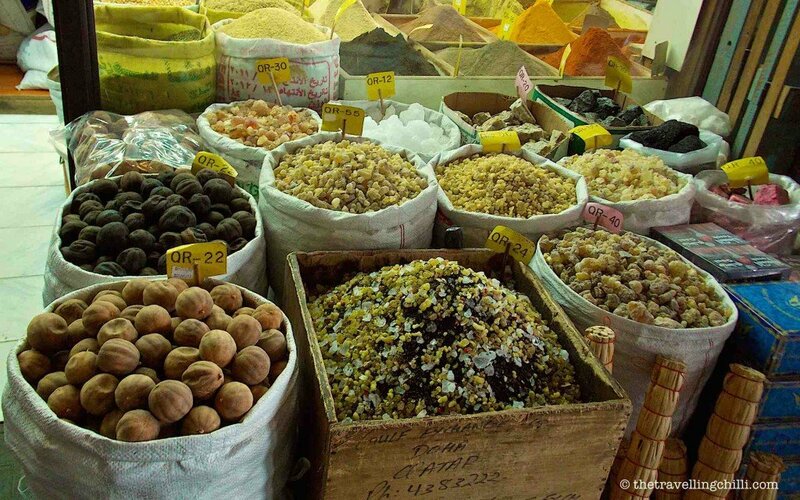 In every Souq you can find good quality dates, pistachios, peanuts, cashews, sunflower and pumpkin seeds and other dried fruits. Dates are locally grown and very popular to eat in Qatar. What many people don’t know is that there are many types of dates which range in size, colour and sweetness. I would say, just take your pick whatever flavour you prefer, they are really very tasty. First of all, I do not want to promote smoking in any way. 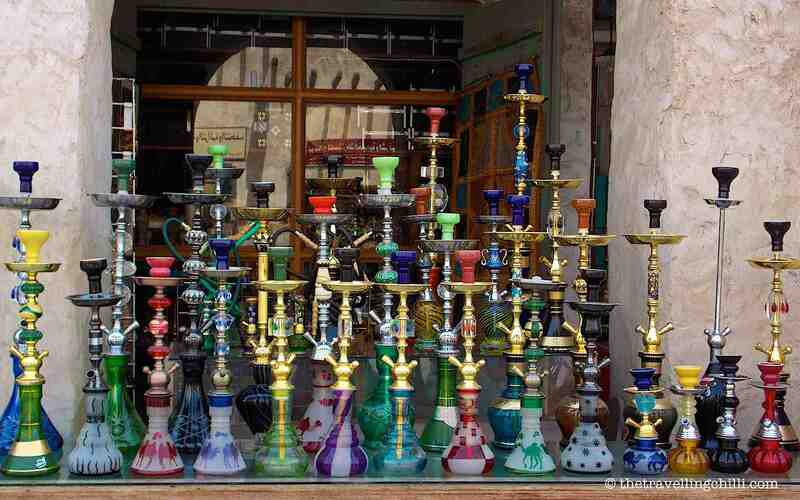 Although I do like the look of a nice colourful shisha for decoration. Ok, a shisha is not a very small item, but they come apart when packing them. I have not bought one myself, yet, but I do like the look of them. All of them look so nicely adorned and so colourful. 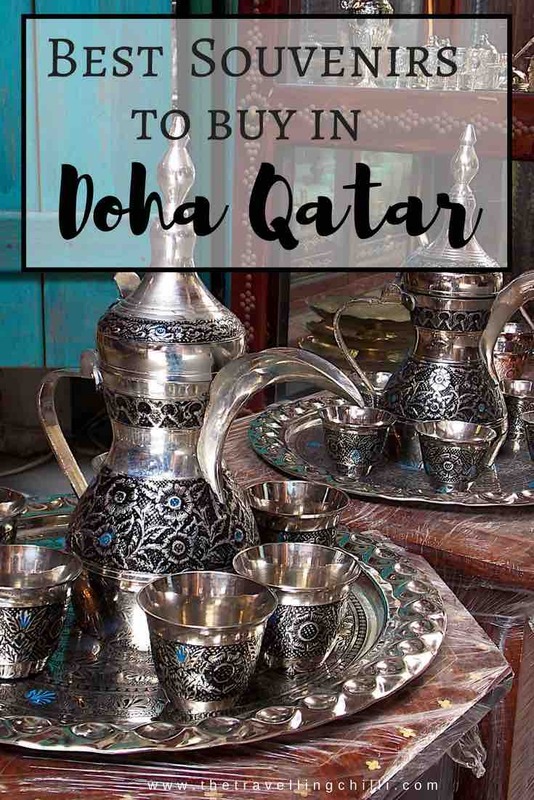 Doha has plenty souvenirs to choose from and take home and the traditional Souqs are pleasant enough to spend some time strolling around and making your choice(s). I Love to bring back tea or spices, but my favorite souvenirs are always key chains which I use as Christmas ‘ornaments’ on my travel Christmas tree. They make me smile every year when I bring them out. I mostly bring back key chains from Southern Africa, never really looked at it when in Qatar. I started out collecting Christmas decorations. 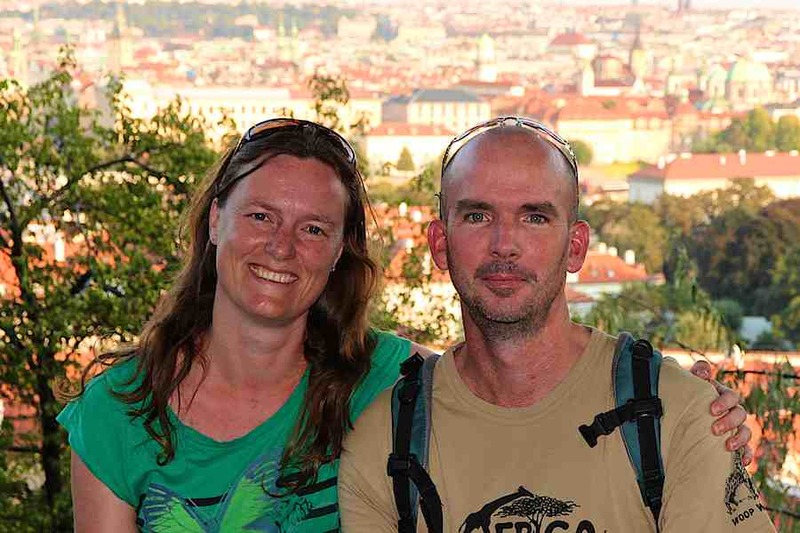 They are small and you don’t have to find a day to day place to keep them, but you can bring them out every year to enjoy them….until I started visiting non Christian countries where you couldn’t really find them. Great pictures and love the 7 things you should buy if you have to. 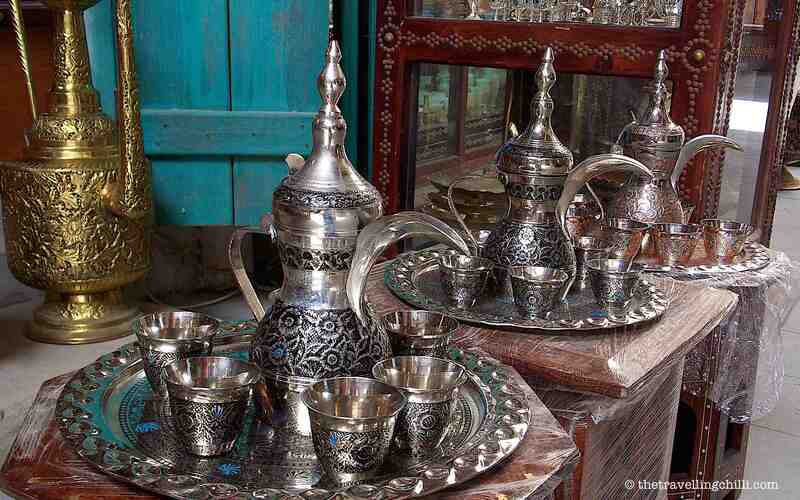 i would definitely try the arabic coffee set since I love the coffee. I collect jewellery and small items that I can use everyday. My favorites include a Christmas Decorations from various places, oven mitts from Buckingham Palace, a Mickey Mouse coffee scoop and wine bottle stopper from Disneyland and some beautiful Waterford crystal champagne glasses from Ireland.